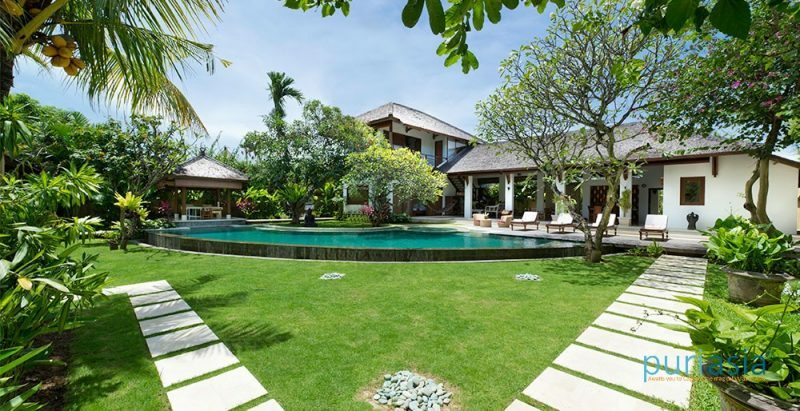 Villa Maharaj is located in the centre of the fashionable Petitenget district of Seminyak on Bali’s south-west coast, this gorgeous four-bedroom villa offers an oasis to escape to and rejuvenate. Perfect for family living, The Maharaj welcomes with informality, caring staff and calming influences, providing a comfortable hideaway with mature gardens and inviting 12m pool, sun-drenched rooms and tranquil sitting areas. Villa Maharaj’s owners and informal but attentive staff have created a peaceful hideaway, ideal for families, where guests feel relaxed enough to pop in and out of the kitchen at mealtimes, or talk at length about local customs and recommended dining spots with the amiable – and consummate – villa manager. 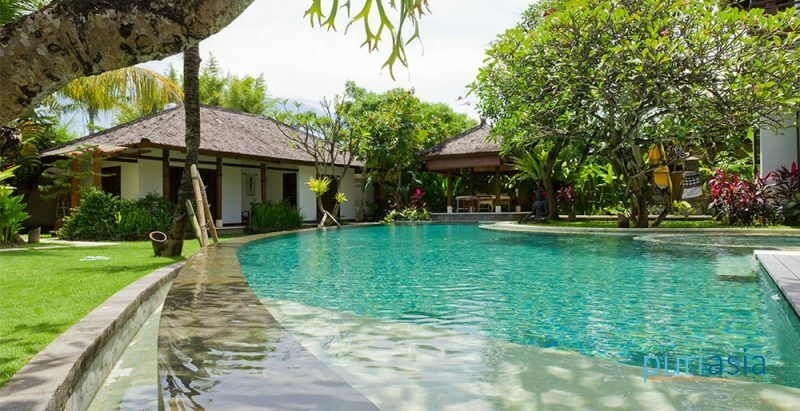 For those wanting to shop, party and indulge, Villa Maharaj is also right in the centre of one of Bali’s most sought-after areas, the happening and trendy Petitenget district of Seminyak – the cosmopolitan heart of Bali. This jetsetter’s paradise, crammed with world-class gourmet restaurants, designer spas, boutiques and hip nightspots, is within walking distance, while beautiful Petitenget beach, with its renowned beach clubs, Indian Ocean surf and fabulous sunsets, is a pebbles’ throw away. 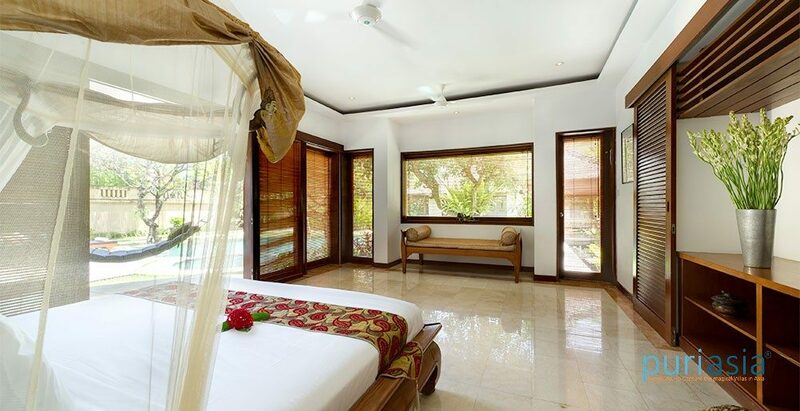 Villa Maharaj contains four ensuite bedrooms plus one nanny or child’s room. Each of the bedrooms features glass and wood patio doors, floor-to-ceiling windows shielded by contemporary-style wood blinds and marble floors. In keeping with the homely ambiance, bedrooms are simply but tastefully furnished with nut-brown wood furniture and the odd splash of modern art; décor and gadgetry are kept to a minimum. The beds in all four rooms are draped with elaborate white mosquito net canopies. Air-conditioning (camouflaged behind wood grills) and ceiling fans keep spaces cool. 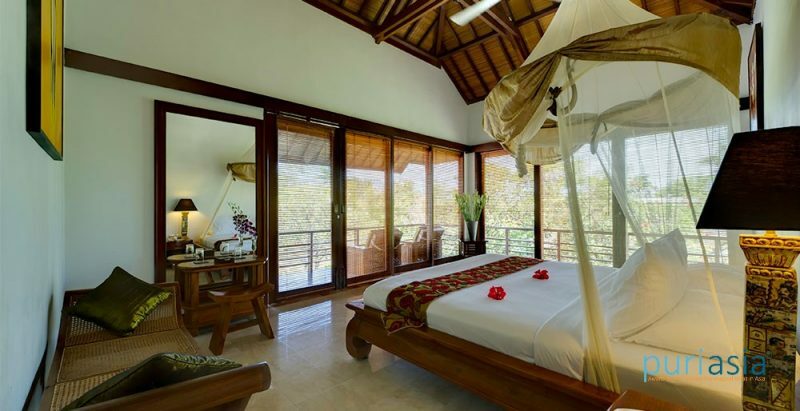 The villa’s largest bedroom is located on the ground floor of the double-storey accommodation wing. Three glass patio doors provide direct pool access and approximately half of the room is encased in floor-to-ceiling windows. 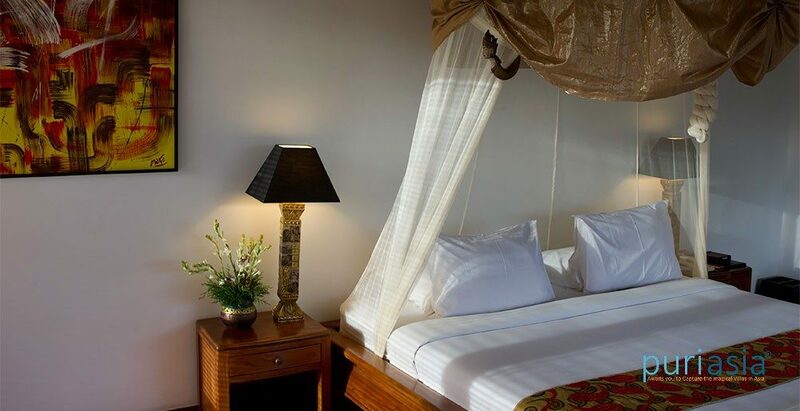 The master room is furnished with a king-size double bed, ottoman and built-in wooden cupboards, while a walk-through wardrobe leads to the indoor bathroom. This stylish room features his n’ hers galvanized aluminum wash basins on a wooden counter, a stand-alone ceramic bathtub and solid stone pieces used as mini-tables. Glass doors lead to a rejuvenating outdoor rain shower with timbered deck. A wooden staircase from the ground-floor leads to the first-floor bedroom and interconnecting nanny or child’s room. Both rooms share an extended timbered deck area. 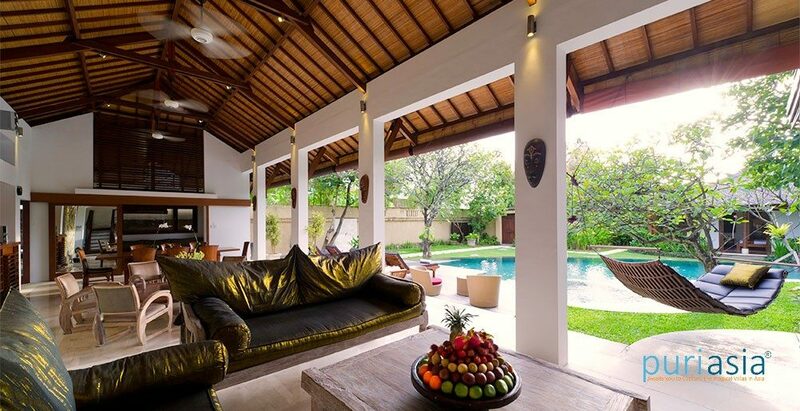 Overlooking the pool and providing two comfy armchairs, this deck makes a pleasant spot to relax, especially at sunset. The upstairs guest bedroom has three patio doors; two of which allow private access to a veranda. Again, this room features a king-size bed, ottoman and walk-through wardrobe leading to an indoor–outdoor bathroom similar in style to that of the master bedroom but without a tub. Small and functional, the nanny or child’s room provides a single bed. 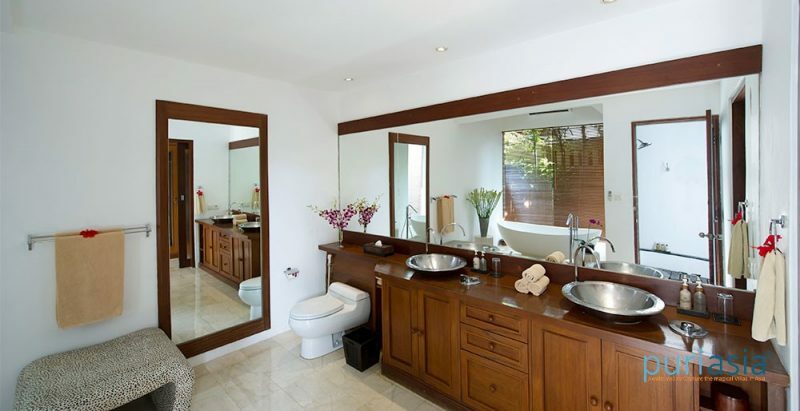 This room interconnects with the guest bedroom and shares its bathroom. On the opposite side of the pool a sweet cottage annex contains two additional ensuite bedrooms, ideally suited to a family. The first features a queen-size bed, small desk and wardrobe. Glass doors lead through to an open-sided bathroom with single galvanized aluminum wash basin and walk-in rain shower. The slightly larger second room features a queen-size bed and walk-in wardrobe. Glass doors lead through to a generous, open-sided bathroom, edged with high walls, tropical plants and bamboo blinds – part covered with split-rattan ceiling. 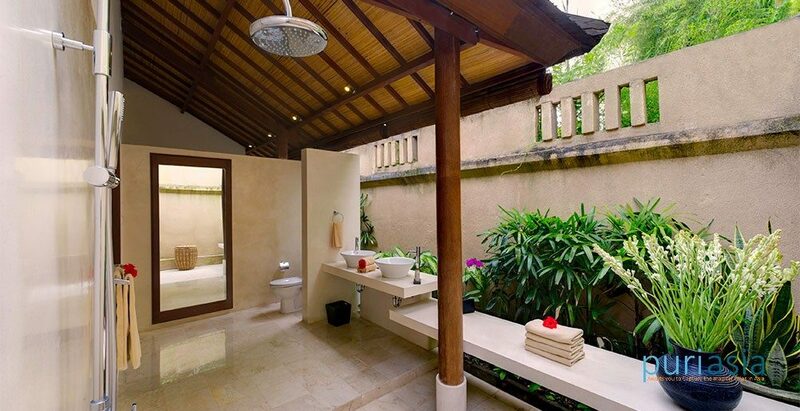 This features two raised ceramic sinks, a lengthy marble table and an open-air rain shower on a stone deck. Between the two bedrooms, and facing the pool, a cosy timbered terrace area with two small armchairs provides a quiet spot for downtime. The ground floor of the main building consists of a sunny, open-plan, open-sided living-dining area, featuring marble floor, thick white pillars and high, traditional-style ceiling. This area is kept cool by four ceiling fans and protected from the weather by bamboo blinds. Touches of ethnic-style décor include a series of primitive wooden masks and extensive, bas relief stone work, illuminated by spotlights. A section of the space is set aside for TV viewing and entertainment, with flat-screen satellite TV and DVD player disguised in a wooden cabinet, plus a stack of board games, books and DVDs. Seating comprises two striking bleached teak sofas and a large table, plus a card table with six chairs. Just outside, a marvelously inviting leather hammock is strung between trees. 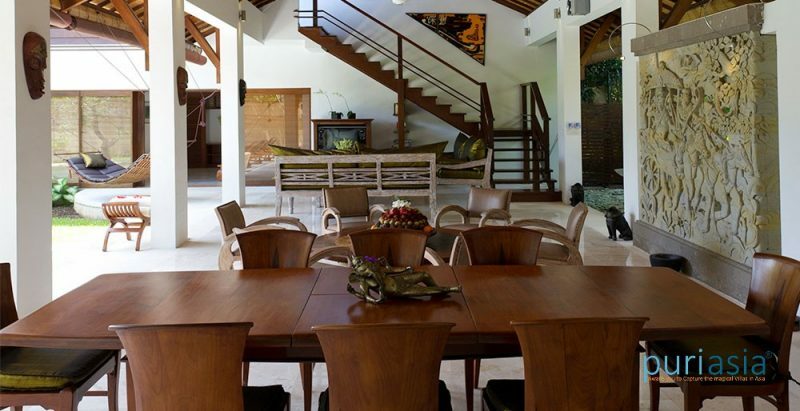 At the opposite end, the dining area features a no-frills, long wooden dining table seating up to ten; a CD player with iPod dock and wall speakers provide sounds. Behind mirrored sliding doors are the simple yet well-equipped kitchen – open-sided at one end and cooled by ceiling fan – and TV room. 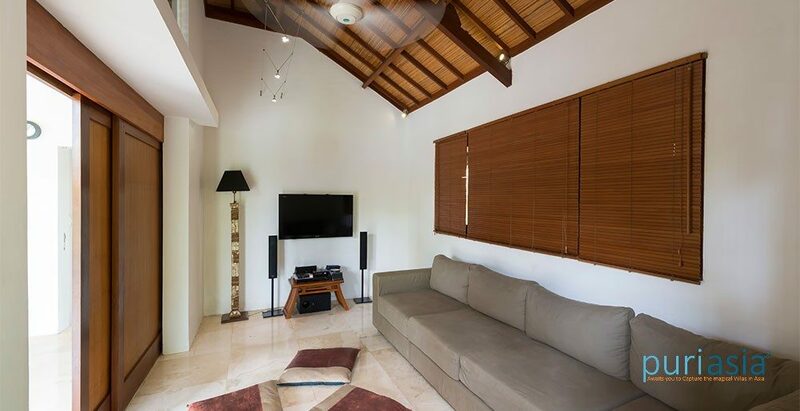 Providing both air conditioning and ceiling fan, this comfortable room comes with satellite flat-screen TV, DVD player and speakers, plus comfy L-shaped sofa and floor cushions. 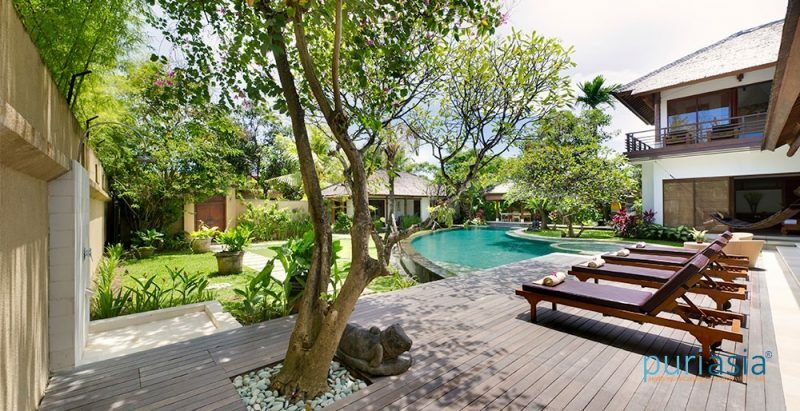 The gorgeous 12 x 4m free-form pool – shaded by aged frangipani trees and coconut palms and overseen by a serene Buddha statue adorned daily with flower garlands – contains a shallow kid’s section and is surrounded by a timbered deck with four sun-loungers, as well as rattan table and chairs: perfect for afternoon tea or sundowners. 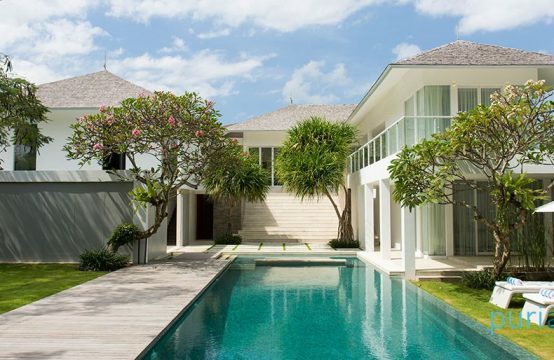 On the left of the pool is an out-in-the-elements shower and on the right the balé, which contains two massage beds for relaxing treatments in a blissful poolside setting. 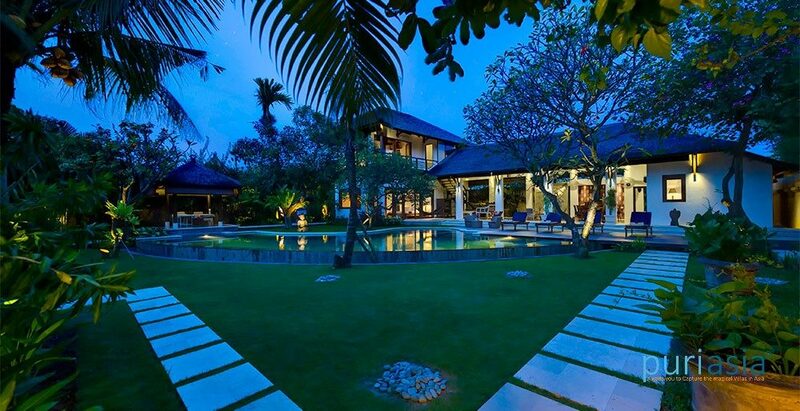 The property is encircled by walls and edged with luscious plants and foliage. 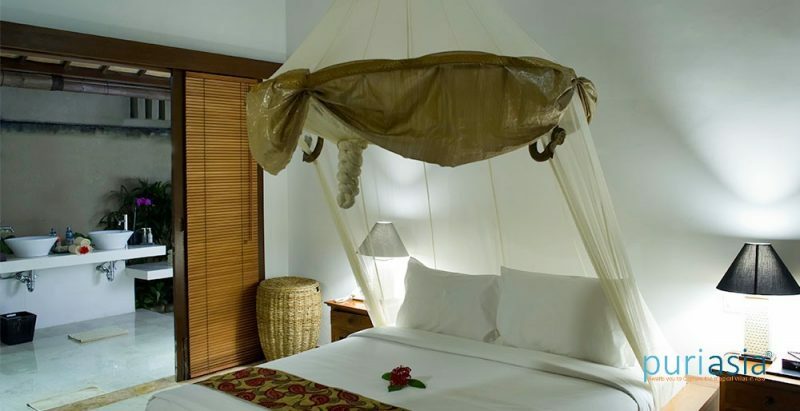 8 guests (4 ensuite bedrooms with 2 king and 2 queen-size beds); plus 1 nanny (or kid’s) room with single bed and baby cot. 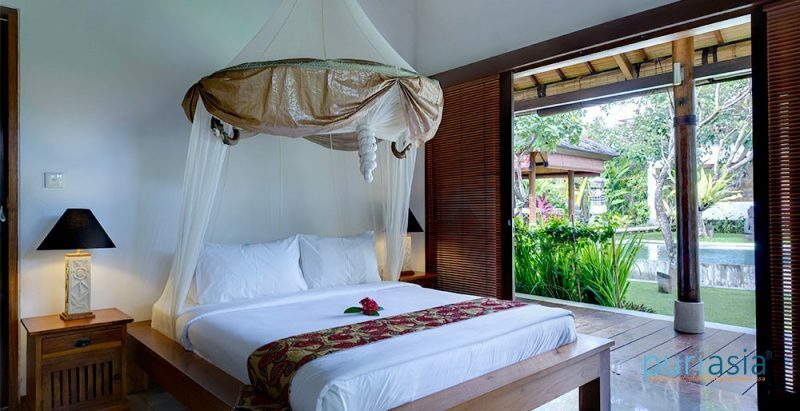 Living-dining and courtyard area; TV room; kitchen; first-floor terrace; cottage annex terrace; garden balé (traditional Balinese gazebo). Total of 9. Full-time manager; villa supervisor; chef; 2 housekeepers; gardener; 3 security guards. Full-time chef providing a wide range of western and Indonesian dishes. Special requests, kid’s menus and other dietary requirements are also accommodated. Telephone in bedrooms and dining area (local and international calls); complimentary WiFi internet access. 2 satellite TVs; 2 DVD players; stereo CD sound system with iPod dock; DVD and book library; hammock; 2 massage beds and spa menu for outsourced spa services. Pool toys; baby cot; high chair; board games; kid’s menu; DVDs and pool section; babysitters arranged on request. Parking space for one car; laundry (extra cost); mini-safety boxes; hairdryer and full bathroom amenities; barbecue; back-up power generator. *Rates are subject to 15.5% service charge, taxes, etc. Please note the above rates are valid until 05 Jan 2019. Please email us if you would like to make a booking after this date.